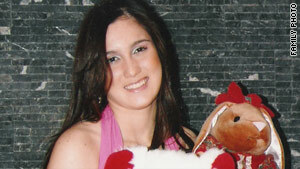 Stephany Flores was found dead last month in Joran van der Sloot's hotel room. (CNN) -- The father of Peruvian murder victim Stephany Flores will meet with a judge Wednesday to give a formal statement, family members told CNN. A 22-year-old Dutchman, Joran van der Sloot, is in Peruvian custody in the case and refused his own opportunity to give the judge a statement. Ricardo Flores will meet Judge Carlos Morales Cordova, who is now in charge of the case, at Morales' office in Lima. As the presiding judge, Morales has the duty to be the chief fact-finder, legal experts told CNN. Morales is getting statements from other potential witnesses as well. For his part, van der Sloot is trying to slow down the legal process by appealing his incarceration and trying to nullify a confession he gave. One judge already denied his claim, but van der Sloot's attorney said his client will immediately appeal the ruling and fight all the way to the Peruvian Supreme Court and international courts, if necessary. CNN's Jean Casarez contributed to this report.